Provide comfort for the family of Lenton Gray with a meaningful gesture of sympathy. In LIEU of flowers, the family appreciates/kindly requests contributions be made in his name/memory/honor to: White Plains Hospital and/or Memorial Sloan Kettering Cancer Center (may be done through donation tab here on website from any tab above or link below; or on your own at www.WPHospital.org), and/or on your own to: White Plains Presbyterian Church, (or simply WPPC), 39 No. Broadway, White Plains, NY 10601, with Endowment Fund in the memo line. Wake will be Friday 6:00-9:00pm, BUT Please note that Viewing may need to end by 7:55pm or so, as there will be a Wake SERVICE from 8:00pm until about 8:45pm or so, during which time there will be NO more viewing at all until it ends, just before the end of the wake, which all ends at 9:00pm. So please govern yourselves accordingly. The Family Thanks you! It is with extreme sadness the family of Lenton Lloyd Gray announces his passing on Friday, March 22, 2019 at the age of 82 years old after a battle with lung cancer. He was an employee of United Hospital, Port Chester, NY for 33 years and a longtime resident of White Plains, NY. He will be lovingly remembered by his dear wife, Carmen Gray of 60 years, his daughters, Sandra Gray Freeman of White Plains, NY, Karen Gray Adams (Michael) of Maryland, Lenton will be fondly remembered by his 3 grandchildren, Nicole Freeman Pierre-Louis (Blaise) of New York, Blake and Hayden Adams of Maryland and great-grandson, Blaise Apollo Pierre-Louis of New York. In addition, his sisters, Carmen Spencer (Franchot), Hortense Morlese (Lidney), two brothers, Betram and Ansel Grey and a host of cousins, nieces, nephews and Ronald Freeman. He is predeceased by two brothers, Kenneth and Wilfred Grey, two sisters, Roselin Grey Haughton and Linnel Grey as well as his parents, Adford and Gertrude Grey and his beloved Aunt Caroline Williams. The Family will receive friends at the White Plains Presbyterian Church, 39 North Broadway, White Plains, NY on Friday, March 29, 2019 from 6-9 pm. Funeral services will be held on Saturday, March 30, 2019 at 9:30AM at the aforementioned church and address. Interment will follow at Kensico Cemetery, Valhalla, NY. 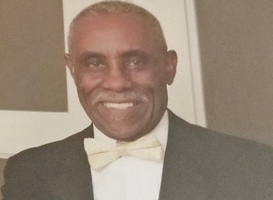 Donations may be made to the White Plains Presbyterian Church Endowment Fund, WPHospital.org and/or to Memorial Sloan Kettering Cancer Center in his memory in lieu of flowers. The Entire Staff of Lee's Funeral Home, LLC respects that the family of Lenton Gray entrusted the care of their loved one to us, and that they value the level of service & attention our funeral home provides. We are honored, in turn, to provide comfort, assistance and service to the family of Lenton Gray during their time of bereavement. In LIEU of flowers, the family appreciates/kindly requests contributions be made in his name/memory/honor to: White Plains Hospital and/or Memorial Sloan Kettering Cancer Center (may be done through donation tab here on website from any tab above or link below; or on your own at www.WPHospital.org), and/or on your own to: White Plains Presbyterian Church, (or simply WPPC), 39 No. Broadway, White Plains, NY 10601, with Endowment Fund in the memo line. If flowers are sent despite family contribution request, they may be delivered on Friday March 29th, 2019 by/before 4:00pm to Lee's Funeral Home, or at 5pm to the White Plains Presbyterian Church. To send flowers in memory of Lenton Lloyd Gray, please visit our Heartfelt Sympathies Store. Wake will be Friday 6:00-9:00pm, BUT Please note that Viewing may need to end by 7:55pm or so, as there will be a Wake SERVICE from 8:00pm until about 8:45pm or so, during which time there will be NO more viewing at all until it ends, just before the end of the wake, which all ends at 9:00pm. So please govern yourselves accordingly. The Family Thanks you! ~~~~~~~~~~~~~~~~~~~~~~~~~~~~~~~~~~~~ In LIEU of flowers, the family appreciates/kindly requests contributions be made in his name/memory/honor to: White Plains Hospital and/or Memorial Sloan Kettering Cancer Center (may be done through donation tab here on website from any tab above or link below; or on your own at www.WPHospital.org), and/or on your own to: White Plains Presbyterian Church, (or simply WPPC), 39 No. Broadway, White Plains, NY 10601, with Endowment Fund in the memo line. If flowers are sent despite family contribution request, they may be delivered on Friday March 29th, 2019 by/before 4:00pm to Lee's Funeral Home, or at 5pm to the White Plains Presbyterian Church. Burial will follow immediately after funeral service Saturday morning. Repast will be at church immediately following/after burial at Kensico Cemetery. We encourage you to share your most beloved memories of Lenton here, so that the family and other loved ones can always see it. You can upload cherished photographs, or share your favorite stories, and can even comment on those shared by others.